Any conference takes the work of many to be a success. For the AMSA 2018 Canyons to Coast conference in Adelaide the organising and scientific committees’ 29 collective members worked tirelessly in preparing for the event over 2 years. All of that hard work and determination paid off with 20 symposia, 230 talks, 37 posters, 10 workshops and multiple social events for delegates to enjoy. The event kicked off with the welcome function on Sunday night at Adelaide Convention Centre, sponsored by SARDI Aquatic Sciences. Plenty of food and flowing drinks in a relaxed atmosphere of smiling faces and chatter provided a lead-in to the following day’s formalities. The official launch of the conference occurred on Monday morning with a moving and entertaining Welcome to Country by young Kaurna man Jack Buckskin, whom put on an impressive didgeridoo performance, mixing traditional and modern culture. The first keynote talk by Dr Gary Greene, a geologist/geophysicist, gave us a history of his work in seafloor mapping. Some of the ground-breaking research that Gary was involved with over the years including mapping landslides through submarine canyons and benthic mapping in northern America, were inspiring to hear. Next, as for every morning of the conference, we had a showcase of talks by leaders of the day’s symposia. This year, we ran a session before lunch for exhibitors to give a 3 minute pitch of their ideas and wares to promote their exhibition stands. Many of the exhibitors were extremely happy for that opportunity as it encouraged more exhibit attendance during the week. Included in the afternoon concurrent sessions on Monday, was the Indigenous Research Priorities Workshop. Speakers with leading roles in Sea Country initiatives, reclaiming rights to Country and cultural practices were invited to present at the workshop. This marked the third AMSA workshop focussed on indigenous engagement in marine science and built on the insights shared at the 2017 Darwin workshop. The broad geographical reach of nation representatives, predominantly from southern Australia, provided a diverse insight to Sea Country knowledge, experiences and future aspirations. Indigenous scientists and scholars shared examples of working strategically within the academic and western science systems towards culturally collaborative research and management of Sea Country. Other talks identified priorities in community Sea Country Plans and nation governance structures that facilitate relationships with governments and scientists to manage Country. Collectively speakers identified the importance of collaborative relationships for protecting and managing Sea Country but also highlighted the need for change and identified actions needed to develop more culturally inclusive research and development. 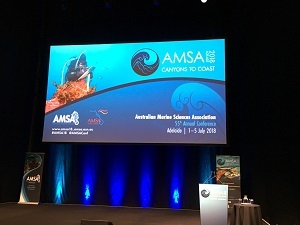 A group discussion concluded the session and resulted in a number of recommendations for AMSA to play a more active role in advocating and promoting Indigenous partnerships in marine science. A report on the information shared and key recommendations will be made available on the AMSA website over the coming months. 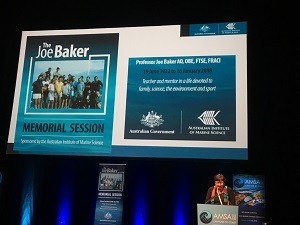 Monday evening saw a tribute to AMSA’s patron Professor Joe Baker, given by Libby Evan-Illidge, who gave an overview of Joe’s scientific achievements along with a reminder of Joe’s constant encouragement of young scientists throughout his life, not least at AMSA conferences, which he always attended, often with his wife Val. We were glad to be joined by Joe’s son Rohan, who provided a special glimpse into Joe’s family life and his love of the ocean. The following poster session was sponsored by AIMS as the ‘Joe Baker Memorial Session’ and it was nice to see lots of discussion with poster presenters; maybe it was the incentive of winning a basket of Haigh’s chocolates! Tuesday morning keynotes were a great start to the day with Prof. Greta Pecl talking about climate-driven shifts in species ranges and Prof. Matt England showing us the oceanographic wonders of Antarctica. Some of Matt’s oceanographic model animations were stunning and showed how far we have come with understanding the complicated aspects of water movement in the ocean. We were spoilt for choice with the afternoon’s concurrent sessions on; climate change, marine mammals, seafloor mapping, carbonate shelfs, estuaries, life histories and connectivity, ecological classification and aquaculture. The student night sponsored by Flinders University followed with honours and PhD students attending for the smorgasbord of food and drinks. Students and mentors were brought together randomly to discuss their perspective on life in marine science and future aspirations. It was a successful evening, typical of AMSA student nights; with plenty of conversation and smiles all around. The keynote on Wednesday morning by Dr Ashley Rowden gave us all a perspective of deep-sea fauna, sediment transport and geological dynamics. The day’s sessions included coral reefs, marine parks and biodiversity conservation, and marine microbes as well as the session on deep sea and canyon ecology, in-line with the overall conference theme. The evening provided an opportunity for marine scientists to engage with the public at a forum and Q & A session ‘Coastal Conflicts’ featuring speakers Matt England, Greta Pecl and Ashley Rowden, which was supported by the RiAus Science Exchange and well attended. The last day of the conference saw the delivery of the Jubilee Award to Prof. David Bellwood who gave us an entertaining insight of his life in marine science. Francessa Gissi accepted the Allen Award for her outstanding work at the postgraduate level. Two talks followed to promote the concurrent themes of genomics in ecology and evolution, and multi-scale climate change research. Other concurrent sessions included ecosystem effects of fishing and aquaculture and marine debris. The marine debris session was attended by Senator Peter Whish-Wilson who gave a talk about marine debris from his perspective at the federal government level. Before long, it was off to pre-dinner drinks for the Gala Dinner sponsored by NESP. First, we farewelled our outgoing national AMSA president Will Figueira. Thanks for everything you have done over the last few years Will! We then welcomed Penny Berents as new AMSA national president. Penny announced the eleven students who were delighted to receive prizes for their hard work in presenting talks and posters. Typical of all AMSA conferences it was a great night to wind-down and reflect on such a great week, but after some great dancing on the dancefloor it was all over. On behalf of the AMSA 2018 organising and scientific committees we would like to thank CSIRO, GeoScience Australia and the other sponsors and exhibitors for their support. Lastly, thank you to all who attended, we were really glad to be hosting this year and we look forward to seeing you all in Fremantle next year. We pass the baton over to the WA team!